I don’t know Guy. I’ve never met him. Nor have I seen any of his talks. I’m sure they’re downers. I prefer to focus on positive change, not humanity’s self-inflicted demise. Guy’s right. 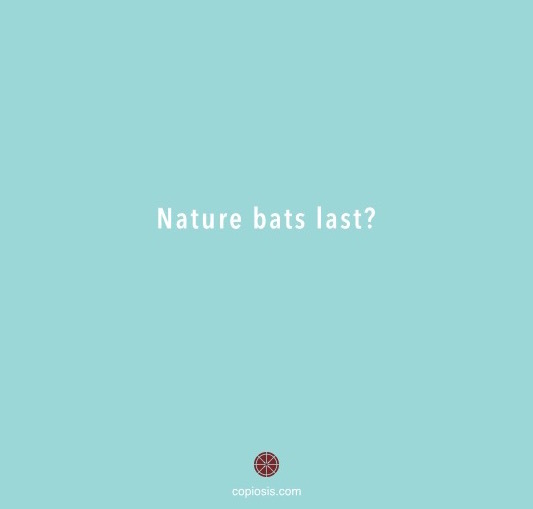 Nature bats last. When I say he’s right, I mean from his perspective. You see, Guy’s perspective is science-based and thorough. I’m sure he’s analyzed the data, looked at the past science, the past meteorology, statements from people before him who agree with him and those who don’t; he focuses on the present, current science, the growing number of people who believe and follow him, the increasing numbers of A-list people joining him, and the numbers who will follow; presumably (I could be wrong) he’s earning a lot from his talks, from enrolling others, from filling his talks with people who believe what he believes, from scaring others into contemplating suicide and from driving others into hopelessness and apathy. The universe is giving him ample evidence to validate his experience and his conclusions, including ample numbers of experts who oppose his ideas and make him feel even more right, or righteous. There are other experts—speakers, writers, bloggers who all agree with his view and to various degrees follow his lead: They, too, earn a living from their work. So from all that present moment evidence, he’s right. But it is difficult to predict a future that is being shaped by innumerable points of focus—focused consciousness—far more influential than Guy’s data-backed opinion. It’s no wonder so many humans (single points of conscious focus) get the future wrong. What is joyously paradoxical about where we are is the paradox of it all. Part of that paradox is this: Guy can be right and humanity can still go on. Here’s why. The universe, as astounding as it is, is capable of validating Guy’s perspective while at the same time validating others’ viewpoints too. We humans make a lot of presumptions about what’s going on here, and we think we’re right. It’s easy to scare people into paying you. That is a basic principle of sales and marketing. People are predisposed to paying attention to perceived danger. Convince someone they’re in danger, and it’s not that hard to get money from them. It’s much harder, but way more satisfying, to the point of grateful tears sometimes, to inspire people to reach for their power, their empowerment, and their connection to who they are through hope, optimism, possibility, and “doing the impossible”. It seems Nature does bat last. But that’s from a perspective that says physical existence is all there is. Actually, your eternal nature is in command here. You got the game going. You call the game’s outcome, own the bats and the field, and you direct Nature’s play strategy. You’ve already won the game by getting it started in the first place. I love statements like “We don’t have time for Copiosis to happen” because I was once in that mindset too. I get it viscerally, including the hopelessness and apathy that comes with it (unless you’re making money on the messaging). This is why I don’t watch doom-and-gloom documentaries or the news, and don’t attend events such as Guy’s—they leave people totally disconnected from their power as creative beings. More importantly, they are not in tune with the theater I choose to operate in. I’m not going to tell you how to think. Instead: let’s just see what happens. Guy is right. So are a lot of other people. From their perspective. This is a slanderous and ignorant essay. You comment on a person whom you’ve not met, whose lectures you admit you’ve not been to and yet dare to compare him to lecturers who demand a fee? You are obviously uneducated in who Dr. Guy R. McPherson is or what his philosophy is. He holds to a gift economy. You should look it up. How you can even comment on him is beyond comprehension. You may as well be writing an analysis of the flying spaghetti monster of which you know about as much. I met Dr. McPherson almost two years ago when he spoke in a neighboring town. Shortly thereafter I decided to follow him for a year and make a documentary about him. His words to live lives of excellence and do what you love inspired me to fulfill my lifelong dream to make a film of great meaning. The film, Going Dark, is only 30 minutes of the hundreds of hours I shot of him interacting with people, sharing with them, crying with them, but mostly laughing with them. He is a very funny person! His warmth and caring personality endear him to just about everyone he meets. There are rare exceptions, usually they are either mentally unstable or well paid by the fossil fuel industry. He does not ask for a fee to speak and only on rare occasions did he ask for donations to help people who hosted him so they could be somewhat reimbursed for his travel costs and food. The hosts pay for his flight and food. He stays with them, not in hotels like most lecturers, sleeping frequently on couches too short for his lanky 6’3″ frame. Several times hosts busy with their lives have even forgotten to make sure he gets a meal. Hardly a luxury experience, but definitely an adventure. I paid 99% of my way during that year and was pleasantly surprised by one group of Canadians who were thrilled to help pay for my flight to Sudbury and for my housing! These were not rich folk, but they were warm and generous Socialists who pooled their money together to bring him out there to speak. I shot the film with minimum of donations and do not expect to recoup 90% of what I expended. That is the world of documentaries especially in the age of contraction and collapse. My goal was not to make money, but to share with the world the man and his message, both of which you remain astonishingly clueless to, yet arrogantly, like most entitled, white men you think you know everything and are happy to blather ignorantly on that which you know practically nothing about. I’ve been at the mud hut, I’ve met his lovely wife and woefully unhelpful partners, and seen the simple lives they live. These are not financially wealthy people, but they are spiritually and intellectually wealthy. The gift that Guy has given so many of us could never have been found from lies of the mainstream. He has given us purpose to pursue our dreams, to get off the hamster wheel and out of the rat race, to speak truth to power and to use our cognitive intelligence to seek out lies and embrace truths. I dare you to meet him and eat your words. Thanks Pauline for your comment and for setting the record straight an who Guy is. As I said in the post however, I was probably incorrect about my PRESUMPTION. I also stated that he is right as far as his perspective is concerned. BTW, blogs are not journalism. They are by nature opinion. That means they do not have to stand up to the rigors of journalism. I appreciate your opinion and welcome you to continue reading. PS – I have been wrong many many times, and often say I prefer being wrong to being right, for at least I learn something. I hope some day to meet him! Thanks for setting the record (and me) straight Erica. I don’t know Guy (obviously). I attempted to characterize my perspective of his content in a way that honored his perspective, while offering an alternative. Obviously, I have raised the ire of some people. Blogs are supposed to be authentic representations of the writers. That means, the blog writer is going to get things wrong sometimes. It means, they will say things people disagree with. That is the nature of blogs. While others have attacked me for this post, I appreciate the response you made, which is well-reasoned, filled with corrections to my presumptions (which by the way is how I characterized my statements) and I deeply appreciate your insight. Thanks for replying Perry. I like what you say about the nature of blogging. It is its own genre Your blog and some of thie “ire” you speak of has made me reflect on honesty and how much I treasure it and how difficult it can be to hear someone elses honesty when it doesn’t match something inside. Copiosis is so radical in its approach to human inter-organization (by radical I mean it is a new idea, or atleast parts of it are brand new) and I see it bringing up a lot of good soil from the depths. Guy McPhereson struck me as “honest” too in that he was delivering a message he felt he had to deliver and he was doing it as rigoursly honest as he could. So onward. I look forward to your next blog and you’ve made me think about blogging once in a while myself…just to stay in touch with how it feels to put ones self out there. Honestly.